At least 56 people have drowned over the past 24 hours, and dozens remain missing, after human traffickers forced 300 African migrants off two Yemen-bound boats and into the sea. Survivors — all Ethiopian and Somali migrants — managed to make their way to Shabwa, a southern province along Yemen’s Arabian Sea coastline, the International Organization for Migration said. At least six people drowned on Thursday after human smugglers forced 180 Ethiopians off their boat and into the choppy waters of the Arabian Sea, an IOM spokesperson told AFP. 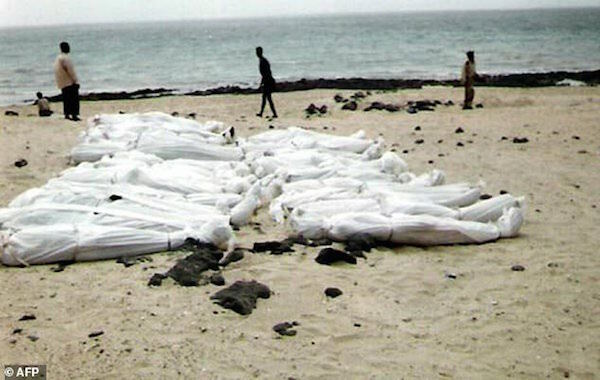 On Wednesday, traffickers also forced more than 120 Somali and Ethiopian migrants into the rough seas off Yemen to avoid arrest by local authorities, leaving at least 50 dead and 22 missing, IOM reported. Laurent de Boeck, IOM’s Yemen mission head, said the boat’s crew immediately returned to Somalia on Wednesday to pick up more migrants headed to Yemen on the same route. Despite the war, smugglers — who are highly active in the Red Sea and the Gulf of Aden — have continued to offer passage through Yemen, which shares a land border with Saudi Arabia.